The C-suite remains a key audience for B2B sales, despite the massive shifts in the business buying landscape we’re experiencing lately. Around 64% of C-level executives (versus 24% of non-C-suite employees) act as the final decision maker in B2B purchases. In situations where CXOs don’t directly make the buying decision, they still wield a huge influence over a large portion of the purchase process. But the average executive’s role has also changed alongside how CXOs deal with marketers and salespeople. To effectively reach and engage today’s C-suite decision makers, B2B companies need to rethink their approach at selling to this crucial segment. In an instructive HBR article titled “Salespeople Need a Strategy for Selling to CEOs”, Frank Cespedes, Jay Galeota, and Michael Wong offer up some actionable insights to help B2B sellers face the challenge of connecting and communicating with today’s CXOs. We put together a quick infographic based on these ideas and backed them up with current stats and practical tips from various other sources. According to the above HBR entry, the C-suite has undergone a significant transformation in the past two decades. One key trend is that the number of executives in charge of integrating different business units and functions hasn’t been able to keep up with the C-suite’s rapid evolution. While the ranks of CXOs reporting to CEOs have doubled, only 35% of Fortune 500 and S&P 500 companies employ a COO responsible for bridging different business areas in the organization together. The lack of in-depth cross-functional perspectives at the top means that it can be challenging for both internal executives and outside sellers to align different stakeholders and departments toward a common action, such as a purchase decision. That’s on top of the numerous disruptions that add to the complexity and uncertainty C-level executives face. A survey by Forbes Insights and KPMG finds that 69% of global CXOs are worried about the increasing number of mission-critical issues completely new to them. It’s in this backdrop that C-level decision makers look for concrete ways to help their organizations meet these challenges head-on. That’s why, when CXOs deal with sales reps from vendors and providers, they’re not just looking for solutions, they also want business insights. The HBR article talks about building a C-suite selling strategy based on three key points: context, content, and contact. Don’t just ask what keeps CXOs up at night; find out what gets them up in the morning. Executives think of specific business outcomes, not intermediate steps. CXOs worry about how decisions affect the entire business, not just a single area or department. Carry out three levels of research: industry-level, company-specific, and executive-focused. Speak the language of the C-suite and talk to CXOs like a peer. Tie all your materials to specific business recommendations and options. CXOs consult at least 5 different pieces of content before reaching out to a vendor. 73% of executives prefer to work with sales reps referred by someone they know. C-level decision makers want reps who can get their team behind the solution. Conclusion: Selling to the C-suite continues to become even more challenging as CXOs themselves face greater complexity and uncertainty. But with the 3 C’s (context, content, and contact), pitching the C-suite becomes more manageable and consistent. 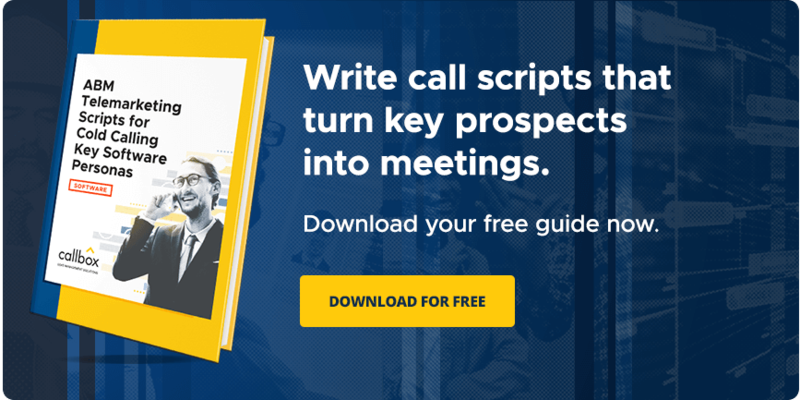 Callbox can help you put the 3 C’s into action with innovative outbound prospecting strategies tailored for C-level audiences. Let’s get you started selling more. Tell us about the executives you want to reach, and we’ll see how we can help.